A large crowd gathered well before the noon opening and by 1:00, it was a full house. Jotaro Saito is one of Japan's foremost Kimono designers and many women wore them to the show and brightened a room darkened in preparation for "The Marbling". He works to create pieces that incorporate both tradtional and contemporary styles. He regularly holds shows in kimono and department stores throughout Japan. 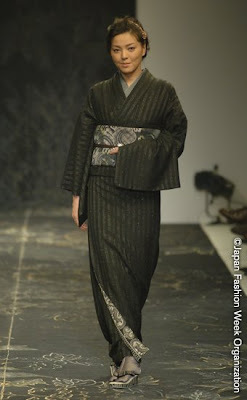 As one of the youngest fashion designers, Saito mixes the traditional with the modern, and the kimonos shown today reflect that mix, both in form and design. 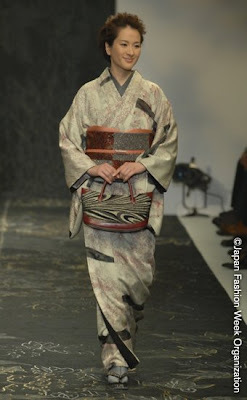 The Japanese models, men and women, were graceful and communicative with the audience. As they walked, individually or in pairs, they paused and turned several times, displaying the fluidity of the material and also the exquisite range of pattern: geometric, floral, stripes or combinations. Swirling greens, greys, browns, blacks, silvers and bright yellows and oranges really caught the eye. 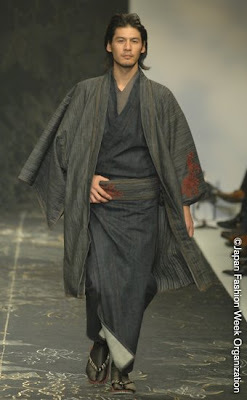 The denim material in the men's kimonos was an especially unusual and creative touch. 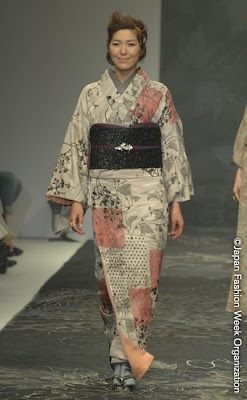 Every gesture had meaning and displayed the kimono and the accessories to perfection. Great pride in culture and sharing its rich history and place in the world were obvious. Jotaro Saito also designs furniture, luggage and art and creates for movie sets, museums, shopping areas and hotels. I was charmed by two women from the Tokyo Peninsula Hotel who invited me to visit and see Jotaro's lobby design and art. He works to create the Japanese spirit "wa" through his creations. More details to follow when I go this May. You can visit his website here for more information. 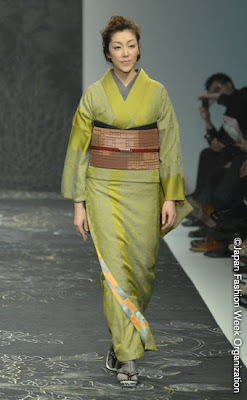 i love that there are still designers who want to preserve historic japanese fashion! these pieces are lovely. Reading this I felt like I was there watching the show with the audience. Great coverage! The kimonos are so beautiful. Great photos.